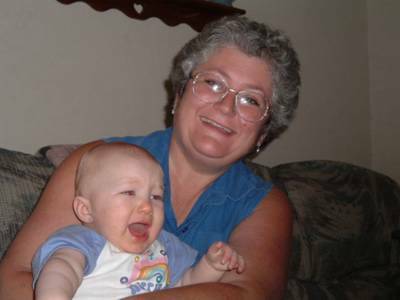 Southern Matriarch: Do you see a Kitty? Do you see a Kitty? I haven't had time to resize the pictures from the fair. But I did stitch another Wee Care gown on the way. I used an older picture smocking plate by Kathy Crisp "Mini More". I used the kitty. I think it looks like a kitty, the husband is not so sure. So what do you think? For a more tailored and gender neutral look I trimmed the sleeves with entredeux instead of lace. 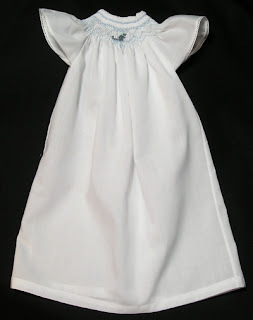 I often smock my wee care gowns with Finca Perle cotton 16. 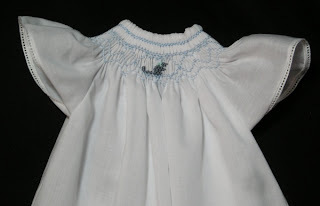 It is the perfect weight to smock these tiny gowns. The 16 is the same size as two stands of cotton floss and it goes so quick. I have a couple of UFO's to take on the plane to Florida with me. I can't travel without some stitching to take with me. I will be back Sunday. I am going to see oldest daughter. Keep stitching. I think the long tail makes it look very "kittyish". Good job! I like it! Is that the plate with the elephants and other tiny things? If so, I have it. Made a crimson red micro check with gray smocking and gray elephant. White ric rac and a matching bonnet. Only in Alabama could you get away with that. This is a perfect gown. Very sweet. Yes, I definitely see the kitty! Great job, Martha. I just enjoy looking at all your dainty dresses! Martha...definitely a kitty!!! I love it!!! Thanks guys. It is nice to know that others can see it too. He had me worried there for a minute. You ought to be in pictures! What is strange in this picture?